Plant type: Tropical perennial ornamental plant, native to Upper Amazon in North West Brazil, tropical South America. Features: Calathea roseo picta is a species of the genus Calathea that comprises of about 25 species and hundreds of subspecies, cultivars, varieties and hybrids that are popularly grown for their exquisitely colored and patterned foliage and some species such as C. burlemarxii, C. crotalifera, C. casapito ‘Bronze Pagoda’ and C. Lutea for their exotic and long-lasting inflorescences (images here). 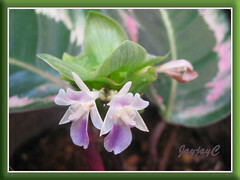 Calathea roseo picta, a short herbaceous and evergreen perennial that grows to about 30-40 cm tall, does produce white and purple flowers but are considered small and insignificant. It is greatly admired for its exceptional ornamental foliage instead. Large, elliptical to somewhat orbicular leaves are held on short reddish-brown petioles. 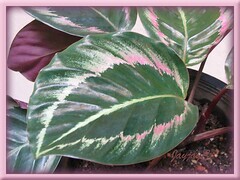 Leaves are glossy and colored dark green with a distinctive rose-colored midrib and an irregular feathered ring of the same rosy color between the margin and midrib. Leaves underside is purple. 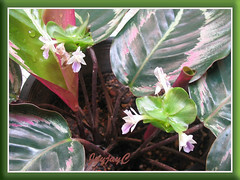 Like many species of the Marantaceae family, Rose Painted Calathea has the characteristic feature of folding up their leaves at dusk (by means of the tiny geniculum, an angular knee-like joint connecting it to the petiole), resembling hands put together in prayer, hence the other common name, Prayer Plant. And, in the morning the leaves will return to normal position, that is, almost perpendicular to the petioles. Culture (Care): An easy-to-grow foliage plant that needs minimal attention, preferring the warm, humid and wet tropical conditions. Light: Bright indirect light or filtered sunlight to partial shade for best growth and foliage coloration, though tolerates low light or full shade. Avoid direct sunlight that will quickly scorch the leaves. Moisture: Medium water requirement. If possible, use soft tepid water or rainwater. Keep soil constantly moist but never water-logged. Overwatering can cause root rot and eventually kill the plant. At lower temperatures, water sparingly and allow soil surface to dry slightly between watering. Provide adequate humidity to prevent browning of leaf margins, by either misting the plant regularly or stand potted houseplant in a saucer of pebbles filled with water almost to the base of pot. Soil: Fertile organic soil with a mix of sand that can retain water, yet free draining and well aerated. Others: Remove burnt or spent leaves/flowers. 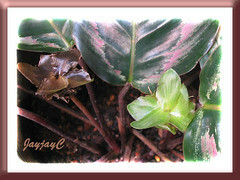 It likes to be pot-bound, hence repot only when pot is overcrowded or the need to propagate arises. Feed once a month during the growing season with a general liquid houseplant fertilizer at reduced strength. It is sensitive to salt accumulation from unabsorbed fertilizer salts that will cause leaf margins to be ‘crispy’ or curled, so flush the soil occasionally with water to neutralize it. Avoid draughts or excessive wind that can cause curling of leaves. Check for spider mites, mealy bugs and caterpillars. Surprisingly, neither disease nor pests have so far invaded our Calathea roseo picta all these years though it is located amongst other foliage plants, such as the Dieffenbachias and Spathiphyllum spp. that are so susceptible to whiteflies and mealy bugs infestation. 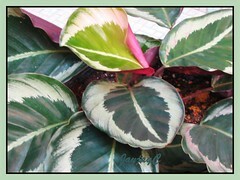 Nonetheless, there are problems, as presented in the University of Florida’s Calathea production guide. Propagation: Easily propagated by division. Carefully separate the plants, ensuring that each division has a few plants and roots intact. Pot each division individually, site at a shady spot and mist regularly during the early stages to ensure success. 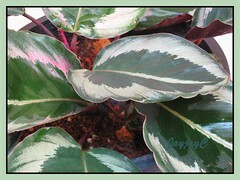 Usage: Calathea roseo picta makes great decorative houseplants and excellent container plants for interiorscapes. Outdoors, grow as fillers or groundcovers in a mix border, garden bed or under shaded trees and palms to add color and variety. Ideal in mix planters too, along with taller plants. 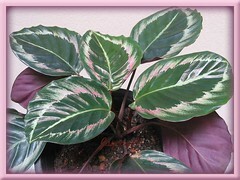 This species, Calathea roseo picta has numerous cultivars (sports) that are exceptionally gorgeous with unique leaf variegation and designs. Growing in our garden is the lovely cultivar named ‘Eclipse’. It is a compact and dwarf cultivar with clump-forming and spreading growth habit that is about 15-20 cm in height and slightly more in width. Leaves held on short petioles (7-9.5 cm long) that emerge from the crown are large and somewhat orbicular (ranging from 12-15.5 cm in length, and 10-13 cm in width) with a mucronate tip and an obtuse base. Leaf margins and upper surface appear wonderfully wavy or undulated. Glossy leaves are colored dark green and fabulously patterned with a fine-feathered midrib of silvery-green that has a rose tinge. Encircling slightly inside the leaf’s dark green margin is a distinctive broad brushstroke band, of the same colors as the midrib though the pink is more intense. The undersides of leaf blade is reddish-purple. As typical of most Calatheas, its leaves fold up in the evening, appearing as if hands held upright in prayer, hence commonly named Prayer Plant ‘Eclipse’. It bears small and insignificant white and purple flowers, peeping out from apple-green bracts. An absolutely fabulous and dramatic beauty! Read about their description and other information at Free Patents Online. Wow! 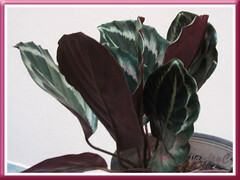 How delightful, our Calathea roseo picta cv. ‘Elipse’ has finally decided to flower after more than 2 years! The best part is we got a double bonus – two flowering stalks instead of one, and both have been blooming non-stop since early October and still going strong till today! Enjoy their beauty below and a few more images here. Both the flowering stalks kept producing blooms daily and became exhausted only after 5-6 weeks. Such a long-flowering period, after which the bracts gradually turned chocolaty in color and withered gracefully 1-2 weeks later. When I came back from vacation my Cora Calathea leaves have curled becase of forgotten watering. It was dry so i have been watering and looking after it for the last week and the leaves are stilled curled. Is there anything I can do? Hi Cheryl! If my plants were in the same condition as yours, I would have done what you did, that is, water regularly to keep the soil moist though not soggy. And, if the leaves still remain curled, dried and wilted, I’ll trim them off to conserve energy for the underground roots to produce new plants, and wait patiently and hopefully to see new growth, while still continuing to care for it. I will not write-it-off so soon. Hope your plant survive the drought stress! I bought Calathea roseo picta for my daughters office. The plant did fine for about a year and now its leaves are curling and turning brown. How to care for it? Any help would be appreciated! Hi Sue! Please refer to sub-items ‘Moisture’ and ‘Others’ in the above article that may be helpful. All the best to you.